In China, a CEO is treated like a king! Police escorts, personal meals with the mayor, gifts at every gathering?and the business ain't bad, either! With headlines about China's economic advance continuing to appear weekly in worldwide publications and on the news, what better time for American CEOs to look to China for business opportunities. Enter Joe Mancuso, author of The China Picture Book: The CEO Clubs of China (Brown Books Publishing Group). After Mancuso was invited for an extended visit to China in 2002, he immediately realized the potential wealth that existed for business opportunities?and, that globalization is driven not just by major corporations, but by individual entrepreneurs. Already the founder of the CEO Club in America (a nonprofit organization started in 1977), Mancuso worked closely with his colleague, Simon Guo, and the two of them established the CEO Club in China, which opened its doors in 2003. 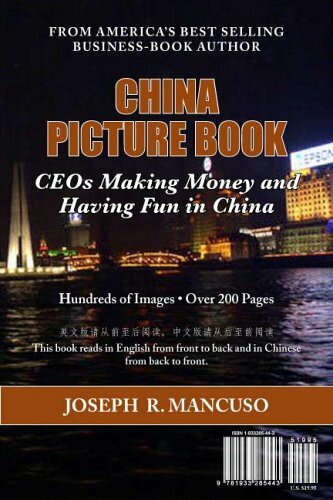 Just two years later, Mancuso took over two hundred American CEOs to China and the result is The China Picture Book. A timely book that provides a firsthand look at American CEOs visiting, networking, and learning how business is done in China, The China Picture Book also provides insight into Asian culture, historical landmarks, and information on all major Chinese cities. Everything a professional might want to learn about China is included?even the best method on how to find a Chinese business partner. This book is a perfect tool for anyone traveling to China or seriously interested in doing business abroad.